How UK Museums Use Mobile Tech to Enhance Visitor Experience? Still behind on my posts….read this piece from December which I wrote for New York based Publishing Perspectives and was headline story of the day. LONDON: When I stepped through the doors of the Natural History Museum in London I seemed to have travelled almost as far back in time as the exhibits. In this land that technology had forgotten there didn’t seem to be any public Wi-Fi and instead I had to rely on 3G to open a website only whose homepage was optimized for mobile. When I wanted to know more about the exhibits it was easier to check Wikipedia about T-Rex than fight through the crowds to see the displays or struggle with a site which seemed more interested in telling me how to get to the museum rather than about the monsters I was seeing when I was there. When I eventually found the museum’s café there I didn’t see a single tablet or laptop as its public Wi-Fi seemed to be a closely guarded secret. In fact the Wi-Fi was actually leaking from the Treasures gallery above and I was finally able to use an app designed by the museum to start argument with my young son about whether dinosaurs had actually turned into birds. For mobile evangelist Mathew Petrie, this is an all-too-common mobile experience for visitors to museums in the UK – museums that have perhaps in the past been more worried about the Starbucks effect of “having people with laptops filling up their cafés” if they installed free Wi-Fi, rather than interested in what their visitor’s expect. Petrie is president and founder of Fusion Research and Analytics, which has for the last year being conducting research for some of the country’s best-known museums including the Natural History Museum into how their visitors use mobile. Mobile, though, is more than just QR codes that “few people use” or providing free Wi-Fi (although that is a good place to begin). It is more than just publishing a couple of apps that soon languish forgotten and un-updated in the app stores or the “souvenir app” for big exhibitions. “People want to search, to effortlessly get more information more quickly, but 50% of visitors are from outside of the UK and they turn off data roaming to save money,” Petrie says. Tablet users tend to want a deeper experience of their visit but not necessarily in front of the exhibit. For Dianne Greig these “well-documented” problems are evidence of a lack of robust visitor data to inform strategies – specifically demographic, experiential and behavioral research. Greig is associate director (digital) of Scottish digital development group Culture Sparks. The result of this is a lack of understanding of the whole customer journey, with mobile becoming a “one size fits all” approach and a “fixation with apps” based on little more than “the fact that other museums and galleries are creating them.” When in fact, Greig argues, a website optimized for mobile would be much more cost-effective to produce. The Huntzz app allows museum-goers to create their own treasure hunts and tours. 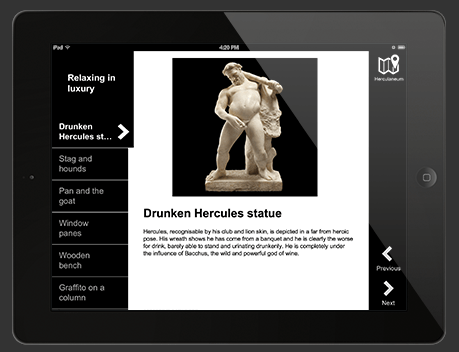 At the moment the Pompei app is “still our main project,” designed by an outside agency owing to a tight timescale. The app is tied in with the museum’s 2013 blockbuster exhibition “Life and death in Pompeii and Herculaneum” and itsPompei Live film that was broadcast live to 250 cinemas in the UK in June almost like a “private view” and shown round the world in a recorded form. “We have learned a lot from it as a trial for future exhibitions.” The tablet version was much more popular than the phone version – despite the phone app being cheaper. The tablet app is content-rich and the phone more useful than educational. “It’s not a yes or no answer,” says Hugh Wallace, head of digital media, National Museums Scotland, to the question as to whether UK museums have been slow to adapt to digital. The National Museum of Scotland has three different apps, including a treasure hunt-type challenge, the highlights of the National Museum of Scotland, and Capture the Museum, which is being developed. The website is also being re-engineered for mobile. 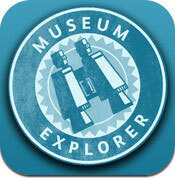 Third party apps like Huntzz now allow museums and visitors to create their own treasure hunts and tours. So perhaps Mathew Petrie’s dreams aren’t too far-fetched: “If in a few years’ time you could say that one in four of visitors are using Wi-Fi then that would be huge. Previous Autonomous vehicles: how safe are trucks without human drivers?